With about 1.5 million cardholders, Bank of the Philippine Islands (BPI) is an industry leader in the credit card segment of the local banking industry. It’s a small number when stacked up against the bank’s 8.5 million depositors and even more minuscule compared to the number of the unbanked individuals in the country. The central bank estimates around 86 percent of Philippine households do not have bank accounts. Still, it’s a good enough base to glean knowledge and insight on Filipinos’ spending habits and behavior. The bank conducted an extensive internal study among its cardholders to find out what it is exactly that they need and want and used the data to create a new product. The result is BPI’s new Signature Card, a partnership with leading international card operator Visa. Packed with new features and offers, it’s the banking giant’s most exclusive card yet. 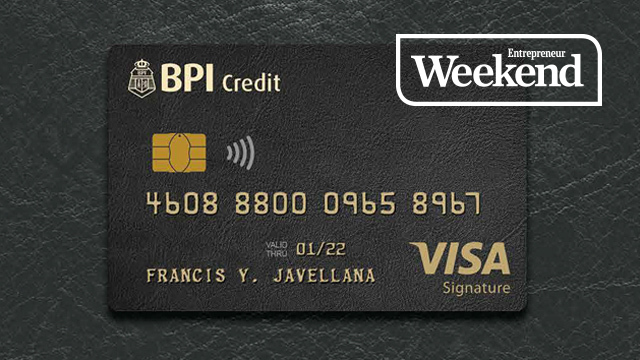 The Visa Signature Card allows cardholders to redeem items and services through rewards points, which BPI claims is one of the best deals in the market. “The highest card that we have today is the Gold card,” Lacerna says. “It gives you points but the current conversion rate is one point for every Php35 spent. For the Visa Signature card, it’s Php20 for one point.” That’s a one-third cut in the effective price of each reward point. Accumulated rewards points can then be used to purchase other items or be transferred to frequent flier programs of partner airlines. In the case of the Visa Signature, cardholders have the option to book-and-buy things like plane fare, hotel stays, car rentals and other travel necessities through their points. Other benefits of the card include lower foreign exchange conversion rates compared to other banks, as well as special rates on a wide array of foreign exchange currencies. The card also comes with a full-fledged concierge service available 24 hours a day, seven days a week. In addition to new product offerings in their credit card business, BPI officials said the bank is actively engaged in programs to narrow the gap between the banked and unbanked in the country. One of these is called Kaya Savings Account (formerly called Easy Savings Account), where the minimum deposit is only Php200 and does not require a maintaining balance. The other is prepaid cards like its Amore card (also a partnership with Visa) that also requires no deposit or minimum maintaining balance. Cardholders just need to load the card through BPI’s branches and use it to pay for products and service just like a regular credit card. BPI is also in the midst of a massive enterprise-wide digitalization program to get more Filipinos to accept more formal banking and savings channels. “We feel that technology is one of the more practical tools to address the unbanked,” says Owen Cammayo, BPI head of Corporate Affairs and Communications. “Filipinos have adapted very quickly to telcos, so we’re doing a lot of investment in digitalization with front-end—things like online connectivity, mobile apps—and back-end.